Why Should You Give The ‘Double Cleansing’ Method A Try? Double cleansing is one of the simplest yet most efficient beauty rituals started ages ago by Japanese and it has been seeing a resurgence these days as a way to cleanse the skin thoroughly. It is basically a two-step method of cleansing that involves two different types of cleansers for achieving a perfectly clean and fresh skin. The first one is essentially an oil itself or an oil-based cleanser while the second one is a regular cleanser of your choice. The act of cleansing the skin twice helps in eliminating the surface layer of dirt, grime, and makeup as well as turning the skin absolutely clean without stripping of moisture and natural oils. How To Choose The Right Cleansers? First Cleanser: Find a suitable cleansing oil that is of medium consistency (should not be too runny or too thick), not greasy or sticky at all, and does not contain compounds like silicone, mineral oils, and chemical preservatives. It is always better to stick to the options that are natural and gentle, such as pure and organic castor oil, coconut oil, sweet almond oil, olive oil, jojoba oil, etc. Second Cleanser: Choose a water-based creamy / foaming cleansing formula that does not contain sodium lauryl / laureth sulfates (SLS) and is mild enough to your skin. It should be packed with nourishing ingredients based on the type of your skin. You can even go with your favorite cleanser for this step. How To Do ‘Double Cleansing’? Start with cleaning your hands. Pat it dry with a soft clean towel. Also, make sure that your face is absolutely dry. Pour a little cleansing oil onto your palm and warm it up by rubbing in between your hands. Apply the warm oil all over your facial skin including the areas under your eyes and around your lips. Massage it gently into your skin by moving your fingertips in the upward direction in a small circular motion. Continue the massage for a couple of minutes so that the dirt, impurities, debris, and makeup accumulated in your pores get dissolved in the oil completely. Dampen a washcloth with warm water and spread it on your face. Let it sit for a minute or so and then, rub your face with it to wipe out the oily residue fully. Take a pea-sized amount of your regular water-based cleanser and apply it to your face by working into a lather with the help of plain water. Massage your face gently with your fingertips for a minute or so. The first step eliminates the ‘oily dirt’ from our skin that is often caused by heavy skincare products, makeup items, excess sebum, etc. while the second step helps our skin get rid of ‘watery dirt’ resulted from perspiration, dead cells, environmental pollutants, etc. 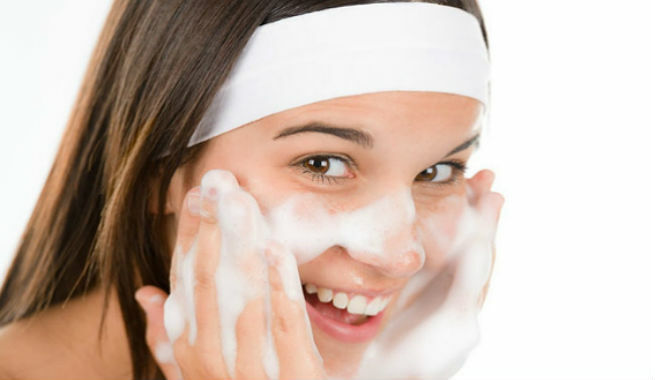 Cleansing twice is helpful for driving away the stubborn dirt and grime that sit on the top of our skin. It opens up clogged skin pores, which eventually prevents the probability of developing acne and breakouts. It indirectly makes the penetration as well as the working of your skincare products like lotions, moisturizers, creams, and serums better. The process of massaging the face aids in the better circulation of blood, which improves the supply of nutrients and oxygen to the cells, thereby giving us a fresher, healthier, and livelier look. However, if your skin is ultra-sensitive and quite prone to acne, breakouts, and rosacea, you must consult a skin specialist before giving the double cleansing method a try.